After finishing up on Korriban, we’re returning to Onderon to finish what we started in episode #5. Our enemy is starting to come out into the light: a group of Sith has encamped on Dxun and is supporting General Vaklu in trying to overthrow the legitimate queen of Onderon. It’s time to split the party: Atton will take Mandalore and Mira to Dxun to deal with the Sith camp, while I will take Visas and Kreia to Onderon to protect the queen. Kreia found my choices…acceptable. From her, that’s practically a glowing compliment. Mira made short work of the mines in the jungle on Dxun, but I was having some trouble with the mobs of Sith in front on Freedon Nadd’s tomb, so I equipped Atton with a stealth unit and moved him passed ALL OF THEM into the tomb until I reached a load point, where it jumped the others up to him. Nice. The Sith “reinforcements” are running right by him. 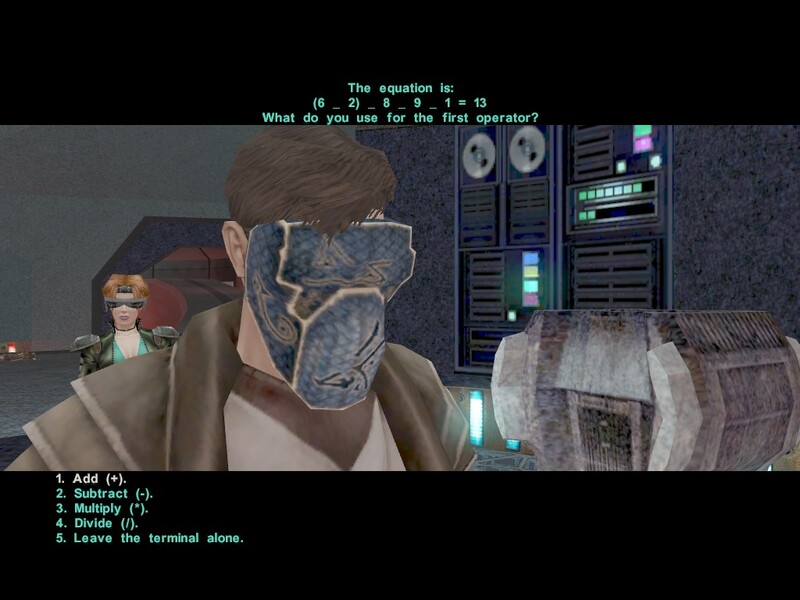 One of my favorite things about the KOTOR games is the in-game references embedded in the names of items. 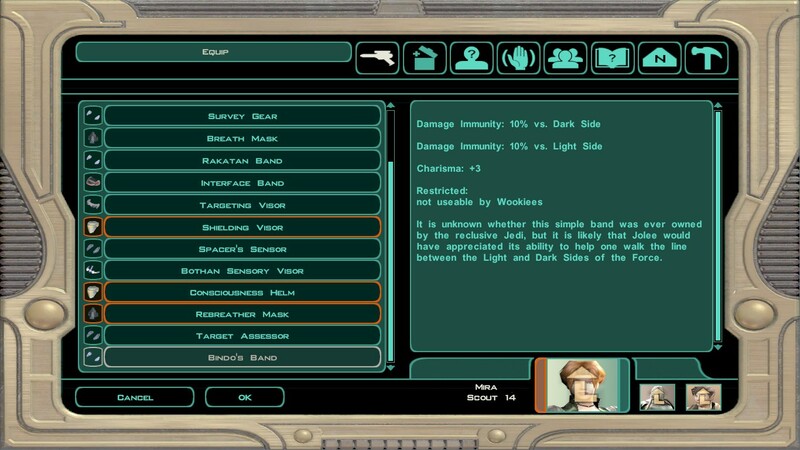 On Dxun, I picked up “Bindo’s Band,” which is headgear giving protection against both dark and light side attacks. 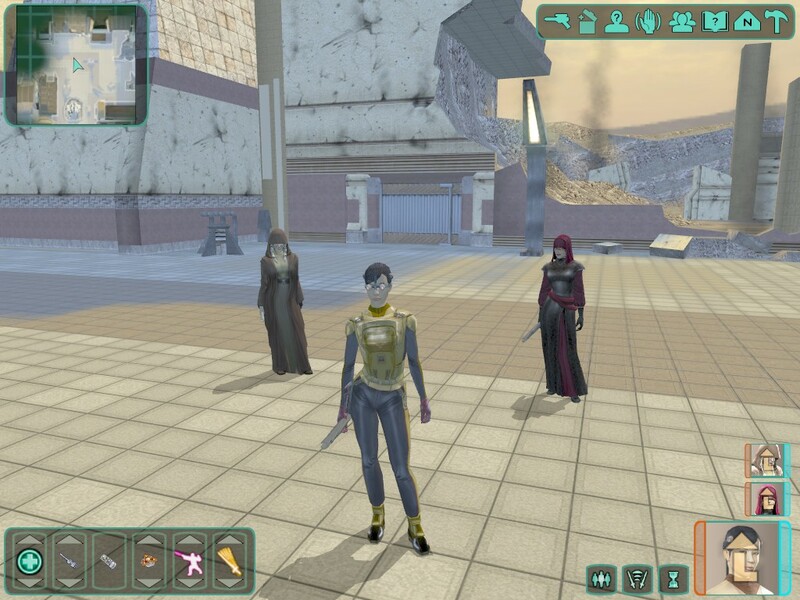 “Bindo” references the grey Jedi Jolee Bindo from the first KOTOR game. I liked him so much I named my cat after him. I got rid of the widescreen, because you can see here it stretches things out weird. Once I got into the tomb, there were several computer terminals that could be access by solving puzzles. I love these!! Time to put my math/logic skills to work. SPOILERS: it’s (6*2)-8+9*1=13, though I suppose the last one could be division also. I guess the parentheses are just to confuse you? Unfortunately, combat inside the tomb was quite difficult and I kept dying. I always keep myself underleveled, because leveling provides an insta-heal during combat. (You can see the arrows over the character portraits in all my screenshots, indicating I’m able to level up.) But typically I’m only one or two levels below where I should be. At this point I checked and discovered that I had 7 levels of XP waiting to be used. 7 levels. Oops. So I leveled everyone up a bunch and things got easier. And Atton got some good character development, facing down the Sith and becoming more Light side. He’s still never going to be a Boy Scout like Carth was, though. I think that’s why Tyria likes him. Meanwhile on Onderon, my Force’s Angels team is fighting its way to the queen. Kreia is unfortunately required for your party here. I haven’t had her in my party in a really long time (she didn’t even have a lightsaber yet), so I had to level her and give her better equipment. I actually tried to give her a red double-bladed lightsaber, until the game politely reminded me that I could not, because…she only has one hand. I was sufficiently ashamed of my insensitivity. Sorry, Kreia. Getting to the queen involved, what else, hacking computer terminals with logic puzzles! In this case, it was to get into the queen’s bedroom, but she’s not actually there, I was just stealing her stuff. Did I mention I’m Light Side? Sorry to disappoint you, Tobin. After heading back to Dxun to meet up with the rest of our group, it’s on to our last planet, Dantooine. We’re at 35 hrs 9 min play time. See you next time to finish up the main storyline before endgame! I love when there are puzzles! I had a computer game as a kid that had basic math equations to solve at certain points.